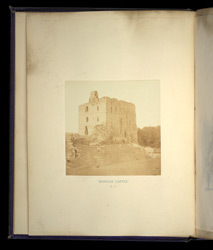 This view of Norham Castle in Northumberland illustrates an 1866 edition of Sir Walter Scott’s long narrative poem ‘Marmion’. It accompanies the opening verses describing the sunset arrival at the castle of Marmion, the “Falcon-Knight”, Lord of Fontenaye, and veteran of many battles. Scott clothes both the warriors at the castle and Lord Marmion’s approaching cavalcade in imagery of elemental illumination, “like lightning from a summer cloud”. The 12th-century castle lies close to the Scottish border and was besieged by King James IV of Scotland in 1513. After bombardment with artillery the garrison surrendered. The king was killed a few days later in the Scottish defeat at Flodden Field, which forms the finale of Scott’s poem. Scott (1771-1832) was the author of immensely popular historical novels and poems. Their epic combination of history, chivalry, and romance was especially beloved by readers of the Victorian era. ‘Marmion: A Tale of Flodden Field’, first published in 1808, tells the story of the noble but arrogant Lord Marmion, a fictional 16th-century English knight in the time of Henry VIII, and the fate of his two loves Clara de Clare and Constance Beverley. The story is intertwined with the antagonism between England and Scotland caused by Henry VIII's attempt to invade France. In response James IV declared war on England and led an invading army south. This edition of the poem is illustrated with 15 photographs by the Glasgow-based photographer Thomas Annan of sites in Northumberland and Scotland which feature in the poem.